Last edited by Ellies Dart; 01/01/19 04:05 AM. NOS Cuda Challenger Parts will trade for other NOS Cuda Challenger Parts. Here are some parts I have. TRADE: 1 pair [right & left] 1937-38 Plymouth tail light Housing to Fender Gaskets. These are Reproductions, but i don't know from who. I bought these back around 1980 or so when i owned a 1938 Plymouth coupe. These should fit sedans i "think". These are Perfect, and still as supple as new. However, there is no packaging. or FREE, and shipped to Lower 48.
all i need is your mailing address. THANKS FOR THE ADD MOPARTS ! Last edited by moparx; 03/11/19 12:46 PM. Reason: Reduced to FREE. Cleaning house ! I picked up this 273 block from a local FABO member as a backup for my old 273. It is a bare block. I don't have that engine anymore so I'm paying it forward. It's standard bore and as far as I know (or was told) it's a '68 block. That's all the information I have. Parts available for pickup in SoCal. Will not be able to ship. May/may not deliver to Spring Fling for free. Block is FREE!!!. PM me if interested. Lots of 68-70 smaller parts. Also Rust Free, perfectly straight 70 Charger Fenders; meant for a Daytona project. 70 Warranty 440 Six Pack Motor; original bore; hot tanked/magna fluxed 15 years. Complete minus the carbs/intake. I have (2) NOS 1971 SBP Rallye Centers with the original Dark Argent paint. The paint treatment on these is very different from what was applied in later production runs. Looking to trade for (2) NOS 71 LBP Rallye Centers with the same-vintage Original Dark Argent. Trades only. 70 hp outboard motor runs good. 1,000. bucks or trade. Looking for some 340 parts all i have is a block. Last edited by HEMI_BEE; 03/29/19 05:37 PM. For Sale: 2000 C5 Corvette Convertible, 49K original miles. Pewter with Black convertible top and black leather imterior. 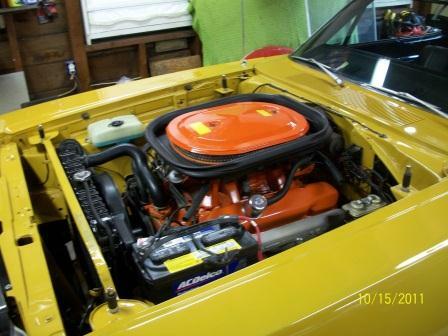 2 owner car and garage kept since new, never hot rodded or modified. 5.7L Automatic, Runs and drives perfectly, new tires with less than 1000 miles, new battery. Beautiful car, no disappointments, no joyriders or trades. $15,500. Car is located in Central Kentucky, I will email detailed pictures if you are interested. PM Me if you are interested. Last edited by 65pacecar; 03/31/19 11:19 AM.